The herbs in this compound work to improve the overall health of the veins, increasing their strength and flexibility. The permeability of the veins is reduced thereby inhibiting edema. Herbal agents prevent the clotting of platelets thus reducing the possibility of venous thrombosis. Suggested for varicose veins, phlebitis, and weak, fragile veins, including hemorrhoids. Also indicated for poor circulation which can cause cold hands and feet, heaviness and fatigue in the legs, and cramping. Also indicated for brain trauma and strokes due to compromised veins and circulation. OS-27 comes in 1 oz. (30ml). Using 30 drops per day this bottle will last about 1 month. Preventive: 10 to 15 drops in water, one to two times per day between meals. Acute: 20 to 25 drops in water, three to five times per day betwen meals. Chronic: 15 to 20 drops in water, three times per day between meals. Topical: Gently apply undiluted drops over the troubled area except in the case of hemorrhoids or very sensitive areas. As needed, dilute 15 to 25 drops per ounce of water. For ulcers or broken skin apply diluted drops around the areas, not directly on them. Note: Do not take more than 75 drops within a 24 hour period. Some situations of vein disease can become serious health problems including the danger of pulmonary embolism, which can threaten life. Seek qualified healthcare. 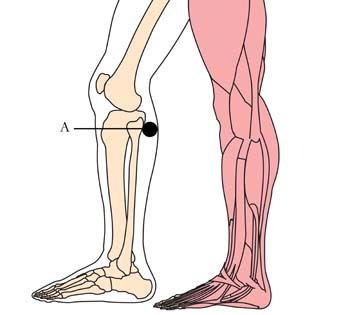 Location: Cell Point A is located on the inside of the leg, below the knee and under the bulge of the bone. Benefits: Relieves knee problems, swelling, leg tension, varicose veins, edema, water retention and cramps. Duration: Start Cell Point application when you begin using OS-27. Continue wearing the Micro-Disks for two to three days after symptoms have cleared. Reapply at the first sign of imbalance.